Some joker at the Washington Post-published Express tabloid apparently isn't a big fan of MSNBC's Tucker Carlson. 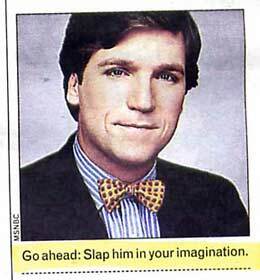 The caption accompanying Carlson's picture in a March 11 story reads "Go ahead: Slap him in your imagination." The photo appeared above a snarky headline reading "Haze of Smug Disappears From Washington Skies," referring to Carlson being dislodged from his one-hour MSNBC perch in favor of a "Race for the White House" program to be anchored by NBC White House correspondent David "Dance Dance Revolution" Gregory. A kinder, gentler take, sans caption, can be found online at the Express Web site. There's no word yet on whether Gregory will reprise his famous dance moves on his new show. Update/Correction (17:26): Corrected from earlier post that mistakenly referred to the Express as the DC Examiner. My apologies for the mislabeling.